x2 - 2x - 8 = x2 - 4x + 2x - 8 = x(x - 4) + 2(x - 4) = (x - 4)(x + 2) The zeroes of the quadratic equation are 4 and -2. Let ∝ = 4 and β = -2 Consider f(x) = x2 - 2x - 8 Sum of the zeroes = …(i) Also, ∝ + β = 4 - 2 = 2 …(ii) Product of the zeroes = …(iii) Also, ∝ β = -8 …(iv) Hence, from (i), (ii), (iii) and (iv),the relationship between the zeroes and their coefficients isverified. 4s2 - 4s + 1 = 4s2 - 2s - 2s + 1 = 2s(2s - 1) - (2s - 1) = (2s - 1)(2s - 1) The zeroes of the quadratic equation are and . Let ∝ = and β = Consider4s2 - 4s + 1 Sum of the zeroes = …(i) Also, ∝ + β = …(ii) Product of the zeroes = …(iii) Also, ∝ β = …(iv) Hence, from (i), (ii), (iii) and (iv),the relationship between the zeroes and their coefficients is verified. h (t) = t2 - 15 = (t + √15)(t - √15) The zeroes of the quadratic equation are and . Let ∝ = and β = Considert2 - 15 = t2 - 0t - 15 Sum of the zeroes = …(i) Also, ∝ + β = …(ii) Product of the zeroes = …(iii) Also, ∝ β = …(iv) Hence, from (i), (ii), (iii) and (iv),the relationship between the zeroes and their coefficients is verified. f(s) = 0 6x2 - 3 - 7x =0 6x2 - 9x + 2x - 3 = 0 3x (2x - 3) + (2x - 3) = 0 (3x + 1) (2x - 3) = 0 The zeroes of a quadratic equation are and . Let ∝ = and β = Consider6x2 - 7x - 3 = 0 Sum of the zeroes = …(i) Also, ∝ + β = …(ii) Product of the zeroes = …(iii) Also, ∝ β = …(iv) Hence, from (i), (ii), (iii) and (iv),the relationship between the zeroes and their coefficients is verified. The zeroes of a quadratic equation are and . 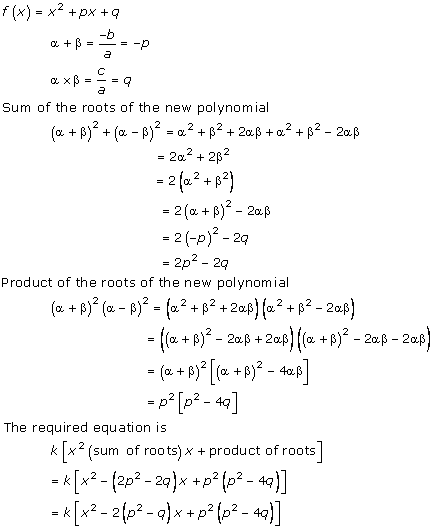 Let ∝ = and β = Consider Sum of the zeroes = …(i) Also, ∝ + β = …(ii) Product of the zeroes = …(iii) Also, ∝ β = …(iv) Hence, from (i), (ii), (iii) and (iv),the relationship between the zeroes and their coefficients is verified. The zeroes of a quadratic equation are and 1. Let ∝ = and β = 1 Consider Sum of the zeroes = …(i) Also, ∝ + β = …(ii) Product of the zeroes = …(iii) Also, ∝ β = …(iv) Hence, from (i), (ii), (iii) and (iv),the relationship between the zeroes and their coefficients is verified. The zeroes of a quadratic equation are a and . Let ∝ = a and β = Consider Sum of the zeroes = …(i) Also, ∝ + β = …(ii) Product of the zeroes = …(iii) Also, ∝ β = …(iv) Hence, from (i), (ii), (iii) and (iv),the relationship between the zeroes and their coefficients is verified. The zeroes of a quadratic equation are and . Let ∝ = and β = Consider =0 Sum of the zeroes = …(i) Also, ∝ + β = …(ii) Product of the zeroes = …(iii) Also, ∝ β = …(iv) Hence, from (i), (ii), (iii) and (iv),the relationship between the zeroes and their coefficients is verified. For the following, find a quadratic polynomial whose sum and product respectively of the zeroes are as given. Also, find the zeroes of these polynomials by factorization. If the zeros of the polynomial f(x) = 2x3 - 15x2 + 37x - 30 are in A.P., find them. What should be added to the polynomial x2 - 5x + 4, so that 3 is the zero of the resulting polynomial ? We know that, if α and β are roots of ax2 + bx + c = 0 then they must satisfy the equation. If 3 is the root of equation it must satisfy equation. so, 2 has to be added in the equation. What should be subtracted to the polynomial x2 - 16x + 30, so that 15 is the zero of resulting polynomial? 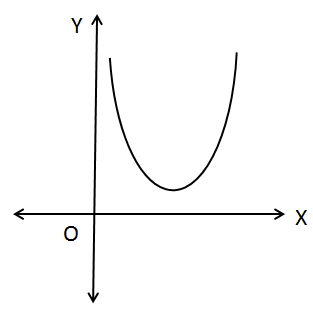 We know that, if α and β are roots of ax2 + bx + c = 0, then α and β must satisfy the equation. and so 15 should be subtracted from the equation. 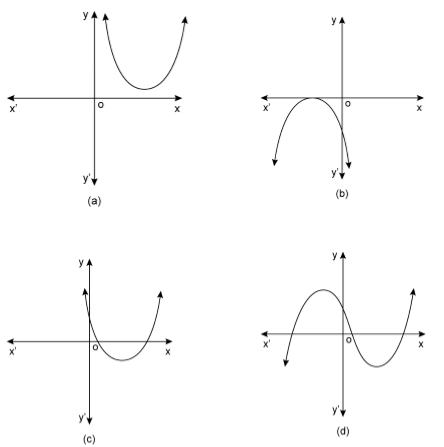 k(x + 2)(x - 5), where k is a constant. Thus, number of polynomials with roots -2 and 5 are infinitely many, since k can take infinitely many values. The zeroes of the quadratic polynomial x2 + 99x + 127 are both negative since all terms are positive. It is given that the zeros of the quadratic polynomial ax2 + bx + c, c ≠ 0 are equal. Hence, 4ac also can never be negative. ⇒ a and c should have same sign. a. has no linear term and constant term is negative. 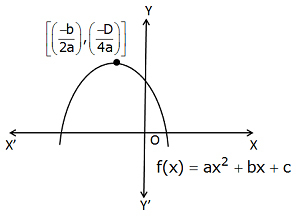 Which of the following is not the graph of a quadratic polynomial? 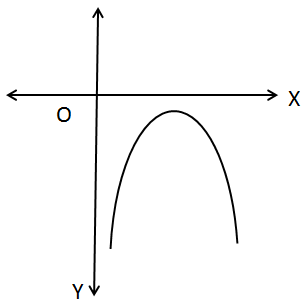 The graph of a quadratic polynomial crosses X-axis at atmost two points.